Peppers of all varieties are my favorite vegetable to grill in the summertime. Or more correctly, to enjoy after my husband grills them. Their sweet, smoky flavor compliments every protein from roast beef to stewed chicken to veggie burgers. They’re delicious in corn relish, atop other sandwich ingredients, or pureed in salsas. They can add an unexpected layer to salads, canapés, or casseroles, or become a brightly colored garnish for almost anything savory. The addition of a little olive oil, vinegar, garlic, and herbs transmogrifies them into a different but equally tempting dish. So what’s not to like? Only the fact that the sweet pepper season seems to extend beyond the barbecue season, at least here on the central CA coast. This is especially true if you’re not at home most days. Grilling after dark is never ideal. Enter our cold weather friend, the oven. It’s even simpler to roast peppers in the oven than on the grill, since you remove the peppers from the heat before flipping them over. Anyway, it appears easier, based upon observing my husband’s work. No need to cut most peppers in half or remove the seeds; that is all done post-roast. True, removing the skins afterwards is a bit messy (I can directly attest to that), but there’s an excitement in seeing plump red and yellow flesh emerge from charred, wrinkled shells. 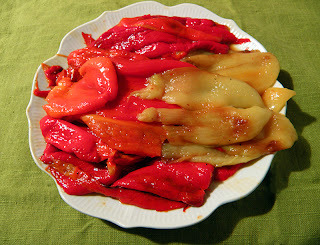 Any kind of sweet red or yellow peppers can be oven roasted. This week we roasted yellow Hungarian waxes and assorted unidentified sweet reds from our CSA. We’ve tried red and yellow bell peppers with success. We’ve even roasted green bells. Though I’m not convinced that roasting green bells is their optimum use, they add a bitter counterpoint to grilled red/yellow/orange bells, a dramatic contrast in both flavor and color. 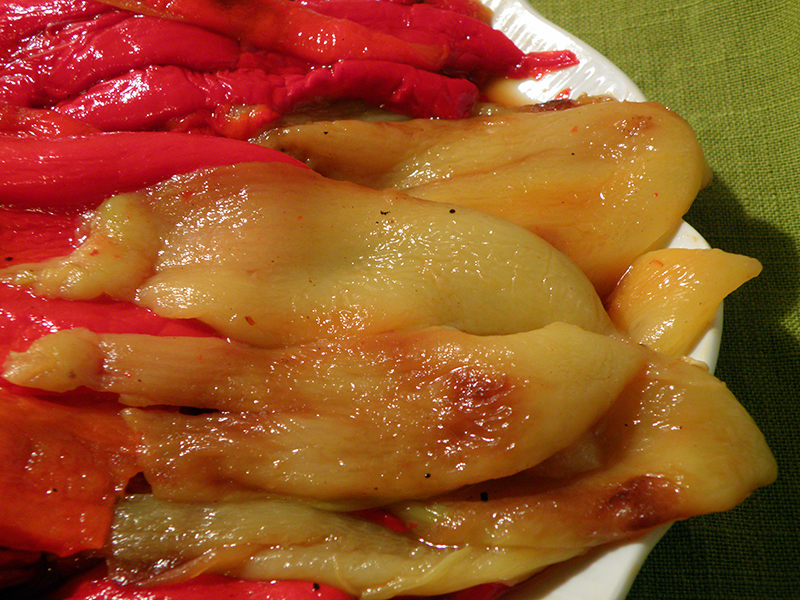 Go ahead and experiment with different peppers. If you’re brave, try some semi-spicy ones, wearing gloves when removing seeds and skin. Let us know how it goes. Line a baking sheet with aluminum foil or spray baking sheet with no-stick spray, if desired (not necessary, but makes cleanup easier). Wash peppers, but leave whole. Remove any squishy spots with paring knife. 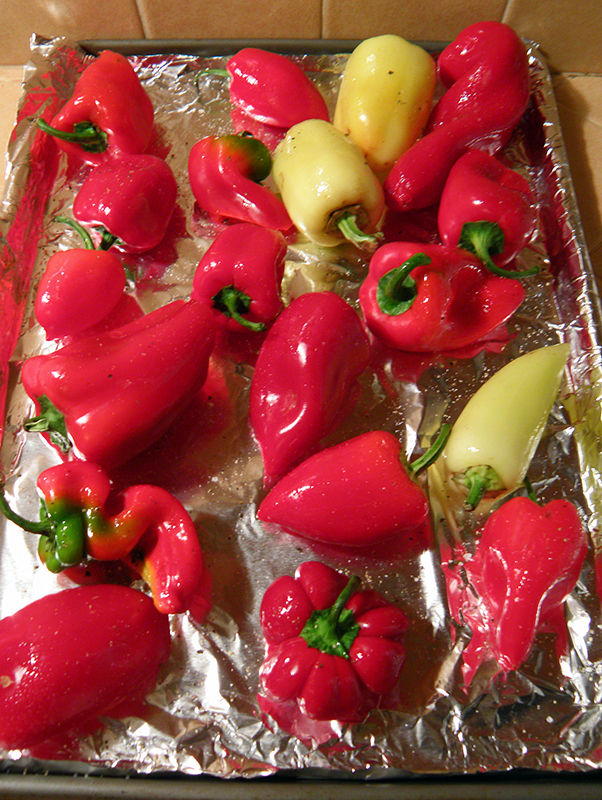 Lay peppers out on baking sheet. Pour a little olive oil into a small cup. 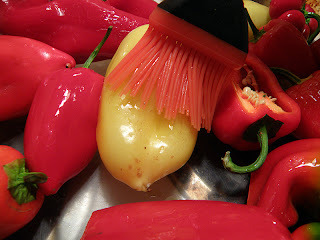 Use a basting brush to coat all surfaces of each pepper lightly with oil. Sprinkle with salt and pepper. Place baking sheet in preheated oven. Check in 10 – 15 minutes. When upper surface of peppers is browned, remove baking sheet from oven. 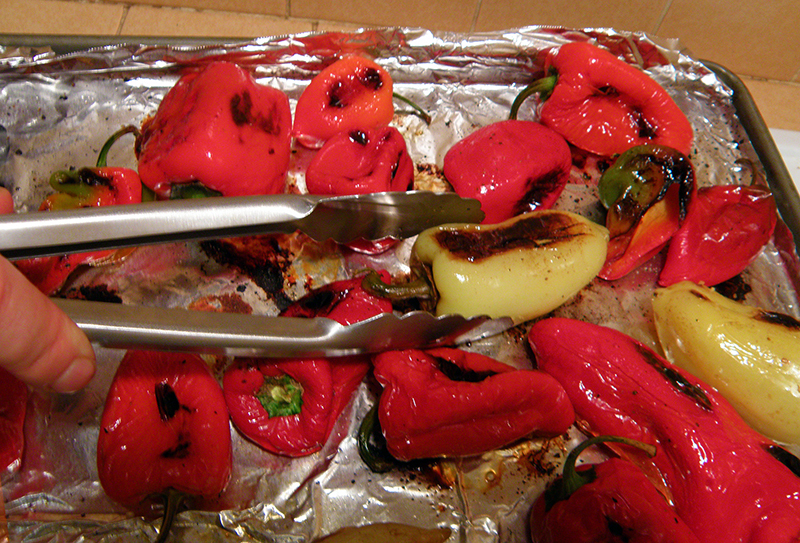 Turn peppers over with tongs, being careful not to puncture them. Continue roasting another 10 minutes, then turn peppers again, putting remaining raw surfaces on top. Repeat every 10 minutes, turning about 3 - 4 times altogether, until surface is uniformly browned/blackened and peppers have collapsed slightly. Remove baking sheet from oven. With tongs, put peppers into paper bag. Immediately wrap bag up tightly. (Alternatively you can put them in a bowl and tightly cover with plastic wrap.) Let peppers cool till they can be handled, about 10 minutes. Pour peppers back onto baking sheet. Twist off stems, pulling out as many seeds as you can. Use fingers or knife to separate skins. Slit pepper and scrape inside with fingers or knife to remove remaining seeds and membranes. Discard seeds, stems, membranes, and skins. Pile peppers on a serving plate, or cool completely and store in sealed container in the refrigerator. To conserve resources, be sure to wash and recycle any aluminum foil that you use. Recycled aluminum requires only 5% of the energy needed to produce so-called virgin aluminum.